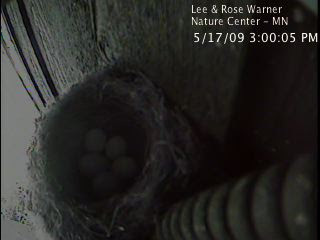 As noted a few days ago, we were up to 7 eggs in the Eastern Phoebe nest at work after a Brown-headed Cowbird added two eggs to the nest. 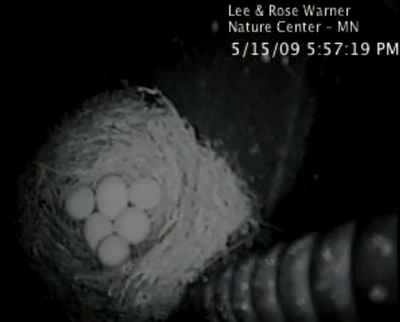 Weirdly, on Friday there were suddenly only 6 eggs in the nest. Eastern Phoebes are not known to remove cowbird eggs so this seemed strange. I took a look on the big monitor we have in our lab downstairs. The lab feed is a direct live video feed of the nest and the image is larger than the stills we can pull from the feed we send to Cornell. I could clearly see that the two cowbird eggs were still in the nest. It was a phoebe egg that was missing. I next looked out the window near the nest and sure enough I could see a broken smashed egg on the ground under the nest. On Saturday, I taught a group of girl scouts and at the end of class we stopped by the monitor so I could tell them about the nest monitoring project and how they can take part. How's this for weird, there's another egg missing from the nest. 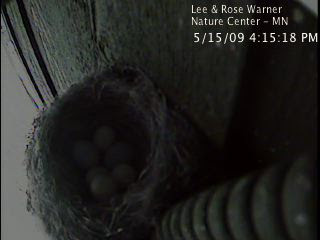 I could see on Saturday that there were only 5 eggs in the nest. 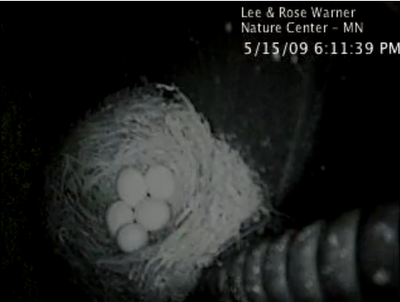 The cowbird eggs are still there but there are only 3 phoebe eggs now. Did she knock them out on purpose? Was it an accident? Did the cowbird return and destroy some of her eggs for some reason? 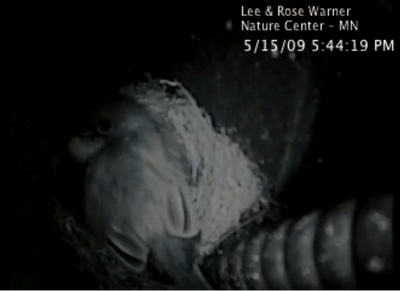 To try to find out I turned to the time lapse videos of the nest on YouTube. On Saturday evening, all six eggs are there at 5:57:19. She returns at 6:03. She moves around a bit and has her head down by the eggs. There is no sign of a cowbird visiting the nest. When she leaves again at 6:11, just 8 minutes later, the sixth egg is gone and there are only 5 in the nest. The one in the upper left, which was closest to her head, is gone. Did she eject the egg on purpose then because she thought the nest was too crowded? One clue may be this image from the same evening at 5:44. Is that an egg she's pushing up toward the edge? Maybe she tried to push it out earlier and was unsuccessful but got it right half and hour later. If I get time I may try to figure out when the first egg went missing and see if anything shows up on the images. Might not be happening in this case, but I've heard of predators taking one or two eggs at a time. However, I've only heard about that with species with larger eggs, like waterfowl...hard to imagine a single phoebe egg making much of a meal!